A great number of Debney's scores from the last couple of years come with a very typical high-tech, secret agent, type of sound. There's Spy Kids, Inspector Gadget, Cats & Dogs. And The Tuxedo. There's a great deal of electronics, Debney brass, some Bond sounding parts (both a la Barry and Arnold) and some sneeking around music. Debney has done this so many times, and they all sound the same, that I just can't stand it. Debney has been typecasted too many times now, and it would be nice with a score that's not written for some spy/secret agent/stupid comedy/action I could care less about. Debney certainly has the talent to write good, orchestral music. It's just too bad he rarely gets to do just that. Anway, that's what I think about Debney's cues on this CD. Bland. What I think about Christophe Beck's cues is this: Sounds exactly like Debney's cues. There's no way telling them apart when it comes to sound - they both share the electronics and the brass. 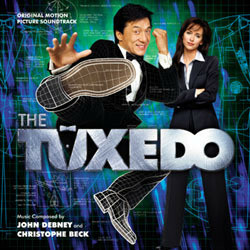 I'm not familiar with Beck's other scores (Stealing Harvard, Big Fat Liar and Buffy the Vampire Slayer among others) but his music for The Tuxedo leaves me just as cold as Debney's parts. Do I sound cranky? If so, it's just because it makes me angry when talented composers have to write the same boring score over and over for fifteen different films just because that's what they're hired for every time. "Hey, that Debney guy writes some excellent spy movie music. We have to get him to do that for this film as well!" How many scores like this does Debney have to write before he will be allowed to move on?